I just wanted to take a moment to thank you for all the help you gave me in training my Wheaten Terrier. As you know, by the time I had found you, I had been to four trainers in an attempt to get my delightful Wheaten, Sam, to pay attention to me. I had no luck whatsoever and felt quite dismayed at the prospects of my eight year old dog being so disobedient. Your style of working with her (and me, of course) worked wonders. The consistency and clarity and hands-on attention paid off and she became quite manageable. She’d never win obedience contests but I was able to walk with her off leash in the woods and trust that she orient to me and return when called. This was no small achievement. 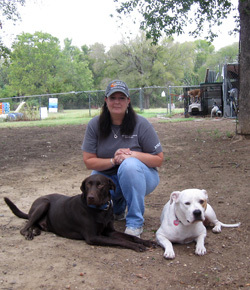 I would not hesitate to recommend your training services and look forward to working with you again with my next dog. I personally want to thank you on behalf of children and staff of the Margaret Fuller Neighborhood House Summer Fun Club ’99. The Micmac dog training and educational workshop was an important component of our camper’s summer experience. Dog and animal safety is a growing concern that is often overlooked by the media and overshadowed by other societal problems. Yet as rural areas continue to diminish and families habituate in denser environments at larger proportions with domestic and wild animals, I believe this concern will only increase. It seems more people want to include pets as part of their urban life, but not enough education is being distributed of how to be safety conscious as a dog owner or as a person encountering an unknown dog or animal. It is for the aforementioned reasons that we are grateful that Micmac is able to provide solutions through solid teaching workshops. Some of our campers had preconceived fears of dogs and those fears would manifest behaviors, which increased their chances for harm when encountering a strange dog. Yet through your non-threatening approach and technique I saw the same children use caution and appreciate and respect the “spirit” of the animal. A few even ventured, with your permission, to pat the gentle dogs you brought to support the workshop. Other campers that were already dog friendly gained greater understanding of the importance of being a responsible owner and to allow unknown dogs their own space and to stay calm. I believe that your workshop gives children, and adults alike, very clear messages to use caution and good sense. These may not be messages they are receiving elsewhere. I also believe that your workshops may also give the children an “inner desire” to raise healthy and good tempered pets which will only combat the abuse many pets suffer today. Throughout the summer after your workshop, my staff observed the children demonstrate behaviors learned in your workshop. This is certainly a testament to your effectiveness. Once again, thank you for giving such a valuable message to our campers and we wish you much success with Micmac Teaching For Dogs. I met Rob Boudreau at a time when I was having problems with my male shepherd mix. He was fear aggressive towards men, fear aggressive towards most other dogs. Rob helped me learn how to control my dog. Before when I would take him out for a walk, it was always a dreadful experience for me. Now that I have more control over him, it is a more pleasurable experience for both of us. Now I actually enjoy taking him for long walks. He still has not completely gotten over his fear of other dogs, but most times when we encounter another dog he shows his willingness to socialize. When Rob first started helping me, my dog was fearful of him and would growl if Rob came too close. By the end of our training sessions, my dog was wagging his tail and was friendly towards Rob. What a difference!!! As you know, The American Dog Owners Association policy of not sponsoring or promoting trainers or training organizations has been in place since our inception in 1970. When you brought the issue before us and asked that we review that policy, we were reluctant to do so. But, since you are an ADOA member in good standing, we agreed to review it. After reviewing your qualifications and your curriculum, we are pleased to advise you that you are the first trainer/training agency in the United States to be approved for ADOA support and sponsorship. We anticipate that this approval will assist you in obtaining more training opportunities in your area and we expect that as a result of the training, those communities in which you present your program will be much better educated in animal behavior and safety. As clients of Micmac Teaching For Dogs, I can honestly say, the trainers have made our life much easier. We are the proud owners of two beautiful Great Danes, and while they are a beautiful breed of dog, they can also be extremely hard to control because of their size. With the help of Micmac, our one-year old female, who was very hard to control, became much more manageable. She was taught all of the basics, such as “heel” and “sit” and able to retain the information and follow commands even after the six-week training period had ended. Our male puppy, who has become increasingly larger in size, is also very easy to control because he was so greatly trained early on. By having a good trainer, we have omitted the problem of two large dogs domineering our household and learned more about managing our pets. When Robert Boudreau first evaluated Lily, she was a dog with no identity and no obedience. We thought that she may have been part Pit Bull and German Shepherd but had no way of knowing for sure because she was a stray that I brought home one day. She knew how to sit and down, but her attention span was null and void. She was a sweet dog and we loved her dearly but she was driving us nuts. Robert first estimated that Lily had some Malinois in her, which we never would have even guessed. He also told us that she needed basic obedience training, which I already thought she had because she could “sit”. I REALLY was wrong, because you can see SO MUCH of a difference in Lily now. The first lesson was about getting her attention and keeping it on you. Next we learned about down/stays. We also worked with Sadie the Pit Bull, who assisted Lily in her attention training. All lessons were conducted with much love and praise. Lily (from what we heard) was an ideal student and worked very well with Robert and us together. Robert was always professional and very patient with his methods. We learned a great deal about dog training from him and also about common misconceptions about dogs and certain breeds of dogs. I would highly recommend the Micmac Dog Training Program to anyone who loves dogs and truly cares for their welfare and happiness! Rosie is doing really well. We’re very pleased we could not have gotten this far without you!! We still have a long way to go. My wife would like to breed Rosie at least one time so we want to have her titled and compete her at some shows. My friend told me about the Dog Whisperer so we started renting the shows from our Net Flix and most of the time the owners are not showing enough dominant behavior with the animals for them to have respect. After which he would take them for a walk and walks them almost identical to what you have showed us then he disciplines them with the popping of the collar just like we learned from you. It’s great to watch just to see some other behaviors of other animals. I would really enjoy working with you as an apprentice. I take the exam for Grand Prairie Police at the end of this month and with school as well I do not think I would be the best candidate. But if I do not make it in and you have not found anyone I would really enjoy working with you. ….”It’s just all kinds of safety and help” she said. One hit was the presentation about area canine units and dog safety with Rob Boudreau, a professional dog trainer who works with the law enforcement animals. “We are trying to show that dogs that do patrol work can still be sociable,” he said, and the presentation illustrated how law enforcement officers have complete control over the impeccably trained dogs. One command, and nothing will keep the animal from capturing and hanging on to the “bad guy,” a trained assistant in a thickly padded safety suit. Another word, and the massive dog will be back to playing and licking the assistant all over his face. Boudreau also taught about bite prevention, and how to act around dogs you do not know to avoid being in danger, and simply raised awareness about canine units in general. I wanted to thank you for your help and instruction in training Hank. I found I was the one who needed the training. Your patients, gift with animals, discipline, and overall knowledge of training made this dog a far better member of the family. After my experience with this training I would recommend training for all dogs and you would be the one recommended. Robert Boudreau with Micmac Teaching For Dogs presented a program on dog safety to the Junior Teens at Sims Library this past summer. Mr. Boudreau also explained the training process of police K9s for this group. He presented exercises with the dogs, which gave those attending an up-close look at the training process. Mr. Boudreau’s presentation was very informative and entertaining. He is very knowledgeable and has a love for what he does. The dogs were presented one at a time under very close supervision. Everyone enjoyed the program. After searching, interviewing many, and hiring and firing no less than 5, yes five, different dog trainers in the Dallas, TX area I’ve finally found what I consider to the perfect one. His credentials include giving seminars as far away as Denmark, home of some of the best working dogs in the world. He and his dogs have competed around the world. I’m just saying anyone in the Dallas, TX area in search of an expert dog trainer modestly priced contact Micmac Teaching For Dogs. Well Rex was given to us by my brother and sister in law on May 2010 he was about 3 to 5 months old now 9 he was a good tempered dog but was starting to have some food aggression problems and snapping at my youngest Olivia when being fed. Well I was tired of this and asked Ginger at Boyce Feed what to do and she said call Rob at MTFD for help. The first meeting was awesome, Rex starting responding to training immediately and within 6 weeks he knew sit, stay, come, heel, down plus now he is doing agility like jumping barrels and going through obstacles and much more. I believe just like Rob that any dog can be trained it just depends what kind of effort are you going to put into it. Now I am starting to learn how to decoy myself for fun but also to help other dog owners. If you haven’t found a solution for your problem then Rob at MTFD is the answer thanks so much Rob. I have been training with Rob for a year in a half and it has been worth every penny. Rob trains your dog and more importantly educates you so you have a great partner. We did basic, intermediate, and advanced obedience initially. Everything we were taught and explained to do was exactly what happened. We have passed the CGC test the first time at only 9 months old with Rob’s training. We have moved on to personal protection and things are progressing with great results. Rob is a wealth of knowledge when it comes to dogs and training. He is a true professional with a high regard for integrity, respect and loyalty. I highly recommend Micmac teaching for dogs. I moved to TX from MI where I met Rob Boudreau online. He was very passionate, considerate, knowledgeable, and a great source of information on dogs. I had a trip to MI for vacation and needed someone to board my dogs. I was very leery about letting anyone watch my dogs, as I don’t really trust anyone to watch them, except family. I’ve had many experiences with boarding kennels, where my dogs lost hair, were very skinny, had gotten fleas and so forth. So for me to let someone I had only met a couple of times, watch my dogs was very hard for me. I called and texted Rob several times to check on them and he assured me that they were doing fine. I ended up staying longer than expected; Rob was great about watching them a few extra days. When I got back to pick up my dogs, to my surprise, the dogs looked great, they were happy, and had no flea issues. More impressionable was that my chocolate lab, that I was ready to place with another person or family because of behavioral issues and to me untrainable, was a completely different dog...he was tolerable, obedient and so much better behaved. Rob was truly a life saver! Not to mention that I checked other facilities and their prices were much higher than his. I’m sure that my dogs would not have been cared for as well or even trained if I were to have gone to any other facility. After this, I didn’t just look at Rob as a random dog trainer. We became friends and I had the utmost respect for anything he told me about dogs or how “I needed to change”. Rob talked to me about the dog club T.A.G.-D. He invited me to visit and see what I thought of it. I have to admit that I was very against what I was seeing at first and told Rob that I would come and support him and the club, but that I would not participate. I was one of those people that did not want any aggression in my dogs. I have 3 kids and 5 grandbabies; their safety is my main concern at all times! For about a year I had been coming to club on and off, as I live about 2 hours from where club is held. Watching and learning I realized how very wrong I was about what Rob teaches and trains. These dogs are more obedient, trustworthy, and friendly as well as being trained more than your ordinary house dogs. These dogs are only aggressive when commanded to under conditions that the owner is in fear for their life or their belongings. They protect their owners with everything. They truly enjoy what they do and love working. Yet they are friendly with everyone including the decoys. From seeing what Rob does with the dogs and owners, I have learned what a protection dog is. I now have 2 dogs in club doing protection work. One of the dogs- Naji, who I rescued from a horrible situation, is now in training under close care of Rob. His story is somewhat long, but in short he was a $1200.00 dog that the breeder abused and neglected. He, as Rob puts it, “one of the hardest dogs I have ever come across.” He said if he was put into the hands of an inexperienced handler it would be guaranteed he would be put down, probably for biting someone and there would be a good chance it would be the handler themselves. In a nutshell because of Rob’s knowledge and experience Naji's life is not only saved but he will advance to become a highly trained competition dog. In addition I have peace of mind and a tremendous amount of pride noticing that I, a novice handler, am able to handle and control the extremely strong and hard dog. Naji is weighing in at 75 lbs. of solid muscle now. I also have another American Bulldog female...Harley. 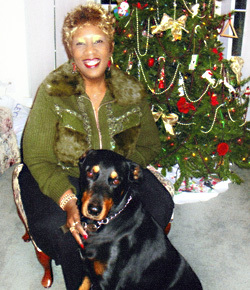 Rob noticed that she had a sweet temperament and was wonderful with kids and suggested I started her in therapy work. She is doing great and advancing well. My goal with her is for her to go to nursing homes and lift the spirits of the elderly. I am also trying to get her into a “Reading with Rover” program, where she will be going to schools, and children in the special needs programs will be able to lay down with her and read. Giving children interest and inspiration to read. All this would NOT be possible if it weren’t for Rob and his great training abilities! He not only trains the dog but also YOU. With Robs overwhelming knowledge about dogs, my 2 American Bulldogs were bred with his help and guidance. All the puppies were amazing, strong, and healthy. I wanted to continue what I’ve learned from Rob, and in fact one of the puppies, I kept. She is now doing protection work, many people don’t realize that there’s many do’s and don’ts with training puppies. My goal for her..Diva, is to title her and go to competitions. I recently went to competition with Rob and the club. I was truly amazed that out of the 4 dogs that won 1st and 2nd place, 3 were all students or prior students of Robs. It shows how well he knows dogs and how to train them properly. I will continue to work with him and the club. As hopefully Naji and Diva will place in the next competition, all thanks to Rob! I would recommend Rob to anyone with the utmost confidence that he will do what’s right for you and your dog. He is a proven dog trainer with 25 years of experience, and it shows in all he does. If you have your dog trained with Rob, you won’t be disappointed, and you and your dog will be better because of his training methods. Ever since I can remember two things in this life I have a passion for... Music and animals. I remember growing up I would spend hours and hours reading every single book and magazines about large dogs. At 8 years of age my dad bought me a German Shepherd ... I named him Link. Link was poisoned when he was 2 years old by a neighbor. I was so heartbroken, my mom told me she would never let me have another dog because of how distraught I was over his passing. But my cousin didn't like that idea too well and brought me a female Doberman puppy named Nina and she brought me back joy again. After Nina passed away I went years without a dog. School and work took most of my time, so I was back to reading everything I could get my hands on about guardian dogs. At 23 I was engaged to be married and thought what better way to start this chapter of my life by adding a four legged companion as well. That's when I bought a Rottweiler puppy and named him Titus. I wanted him to have the best and starting researching training facilities. At 8 weeks old, Titus was a very active puppy going to obedience training at Mans Best Friend. Things were fine until he was about a year old and started protection training at MBF. I left him there for 6 Weeks and the rest of training involved the owner handling the dog. When Titus came back he was a different dog and started showing signs of aggression towards any body except myself. Talking to the trainers at MBF they told me that there was nothing they could do about it other than take Titus in for another 6 weeks of "intense training". Again Titus came back home and was worse than when ever before. The trainers told me that some male rottweilers just grow to be vicious animals and there was nothing else they could help me with. By this time Titus hated my young wife and could no longer stay in the house with us. I started to look for other trainers but no one would want anything to do with him. My last attempt was with a female trainer who guaranteed she worked with aggressive dogs and she would work with Titus. Long story short, the trainer came to the house for the first session and tried to have me stand by her with Titus on the other side of me and pass her the leash and walk away. I asked her if she was crazy and she assured me that everything was under control. So I proceeded to do as instructed and 2 seconds later Titus bit her shoulder. The next day I with the heaviest of hearts had him put down. Fast forward 11 years later to 2011. We moved to a new city, to a gorgeous, cozy little house on a dead end street, right by a heavily treed park. No dogs and everything was fine. The first year was great, the kids were happy. One fateful day our house got broken in and ran sacked. Thankfully nobody was home. We decided to get a guard dog breed that would prevent that from happening again. I researched for months and purchased a 4 year old Doberman. Paid a huge amount of money, but soon after we realized that Scout was way too friendly and happy go lucky and would probably lick a burglar to death. I called a few trainers around and just turned me down saying that Scout was too old to learn anything and that I was better off buying a puppy and just raise him right and with proper protection training I would finally have the dog I desired to protect our family and home. I purchased a German shepherd puppy and named him Link. I wanted to get things right from the beginning and so I started to call more trainers with the hope one would be willing to work with Scout as well as Link. (I had given up on Scout being no more than a pet, but every time we'd put a leash on him he'd walk with no confidence at all. And I wanted him to at least walk on a leash with confidence and his gorgeous ears up). 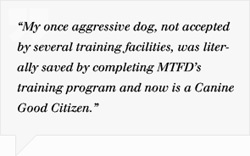 After more research I found MTFD and called Rob in regards to training. Rob was very informative on from the get go and we set up an evaluation appointment for Scout and Link. Link is now 6 months old and because of Rob's expertise, not only is he a obedient puppy, he is excelling in protection work with FULL mouth bites on the sleeve! We have a special needs daughter and adding a rottweiler to the mix was never an option after everything we went through with Titus. But with Rob's guidance and amazing knowledge of dogs we purchased a 10 months old female rottweiler named Roxie. From day one Rob was there on the phone with giving instructions on how to handle Roxie. Roxie now 12 months old, wakes up in the morning goes potty and comes right back in to check on my daughter. My daughter is following in my foot steps and helps me with dog feeding at evening time. She easily handles all 3 dogs on command on the leash and off! Without Rob from MTFD my dreams of owning not one, but three amazing protection dogs would never in a million years come to be true. My dogs will be competing in several trials statewide and hopefully nationwide one day. I don't think there are words to describe how thankful I am to Rob. A real Dog Whisperer. We wanted to write this to let everyone know working with Rob does work. 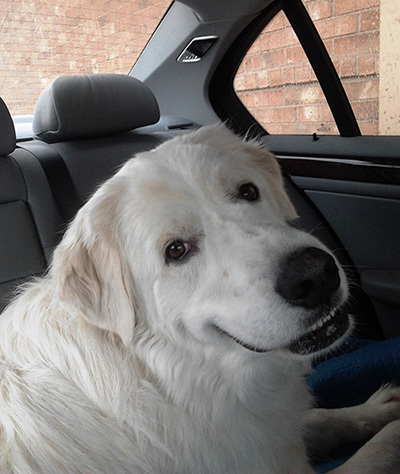 Our Great White Pyrenees Hansel was having a problem with other dogs after having been attacked on his daily walks. Hansel was starting to immediately react when another dog came into his sight which was hard to deal with. Rob was recommended to me and I am very thankful he was. I was feeling very disheartened before finding Micmac Teaching For Dogs. I called throughout the DFW area and got turned down because Hansel was a large dog. The other story I kept getting was pay $600 dollars or more up front then we will show up at your house to start training. I never even met these people and they wanted money with no guarantee up front and that was on the 1st phone call. It took about a week or so of calls before someone told me about Rob! Rob met with us 1st for a reasonable price, evaluated Hansel, answered our questions and his honesty was refreshing. Rob worked with Hansel with his dogs and the difference in Hansel is fantastic! Hansel obeys, he is a happier, he has been out with other dogs and he listens. We strongly recommend working with Rob and MTF Dogs. I took my new one year old Doberman to Rob with Micmac Teaching for K9s. During this period of time my dog improved a great deal. I know that when I left I had been equipped with a lot of knowledge, skills and more confidence than I had come into the program with. I was extremely pleased with the service provided! We are very pleased to provide this testament of our excellent experience with Owner/Trainer, Rob Boudreau of MTK9. Carly and Sam are good, sweet, affectionate dogs and great companions. They are both rescue dogs and while they were not complete hoodlums, they definitely needed some fine tuning in the obedience department. Sam went completely deaf when called and both of them were terrible about pulling on the leash. We put both of them through a round of obedience training through a local pet store but while they learned a few things, the overall result was disappointing. In early 2014 we decided Carly and Sam were overdue for good training. I asked around for recommendations for a good trainer and Rob Boudreau's name came up. We visited with Rob and signed up to begin classes the following week. We diligently practiced what Rob demonstrated with Carly and Sam and experienced amazing results after only a few weeks. It was almost as if Rob waved a magic wand over them. They would consistently sit, down and stay AND would only rarely pull on the leash. When they did pull, a quick correction Rob showed us corrected the problem. Rob's methods are the result of years of experience, patience, repetition and consistency. He is firm but not unkind. You can positively tell he loves dogs and more importantly, understands them! He certainly helped our dogs and us to become better companions for each other. Rob's training fees are competitive and you get a lot for what you spend. There are just not enough positive adjectives to adequately describe our experience with Micmac. You could not find a better trainer anywhere.